Gabrielle Begun is an aspiring young writer from San Francisco, California. She began writing Freddy the Penny when she was eight, and completed it by the age of ten. Her dream is to someday see her beloved tale about Freddy be made into a screenplay. Gabrielle is passionate about the art of writing. She organized the first writer’s club at her school and has been actively running it for around four years. She is a member of the yearbook committee and was offered a job as a copywriter for the school’s yearbook. In April 2013, her writing skills were recognized by the California Association of Teachers of English (CATE) and she received a “Writer of Distinction” Award. 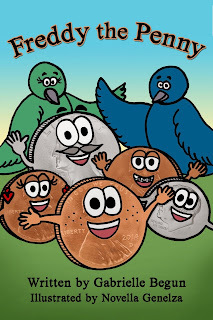 Freddy the Penny by Gabrielle Begun is the tale of Freddy, a brave young penny who goes on an exciting quest. As soon as Freddy enters the world, he is filled with curiosity. His adventures begin when he makes two friends: a pretty penny named Betty and a wise quarter named George. The three friends set out across the country on an adventure, meeting many new friends and even encountering some fearsome foes. Through the characters’ journey, young readers will learn about friendship, family, and more. Kayden is in 1st grade and can read her Freddy the Penny book on her own. Kayden is inspired by the fact that Freddy the Penny was written by a young girl like herself. Kayden is enjoying the adventures of Freddy the Penny and his friends. I was excited to get a copy of Freddy the Penny written by a young author names Gabrielle Begun and Illustrated by Novella Genelza. I love the fact that this children's book is written by a young girl and my little girls were so happy to get to read Gabrielles book. Our 6 yr old will be a 1st grader in the fall and is able to read this book to her little sister. Both girls love this story about Freddy the Penny and his friends adventures. I like that this children's book has an excited storyline with a good message for kids. It is a wonderful addition to our home library. I recommend it for young readers and as a gift for school libraries.